To love above all else with everything you have and your neighbor as yourself requires humility. 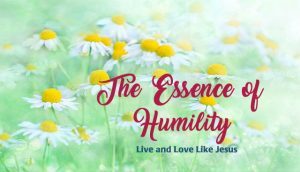 To live, love, (and die) like Jesus did requires great humility. How do we live and love like Jesus? Your stories bring Cinnamah-Brosia and friends’ to life at The Coffee Cottage. Their stories (so yours too) are vital to these devotionals. Stories needed for Volume 3 necessarily need to be lessons, triumphs, and challenges faced in the area of humility as God asks us to reach out in love to others. If you are wondering about this because you have not read The Essence of Courage or The Essence of Joy, please email me for an example. Here are some starters for your stories to get your thoughts moving on this topic. Share about a time God called you to show His love that required humility. You may think of some that I haven’t even touched on here. That’s awesome! Share away. Email your stories to Lynn@LynnUWatson.com. Would like to have these by March 15, please. *The Bible says if you tell what you have done, you already have your reward. How do you serve anonymously? That often requires great humility. *You risked your life to show love to another. *You were overlooked for an honor, promotion, etc, that you truly believed would be yours. You felt the recipient was much less deserving. How did God show you to honor that person and keep jealously from eating you up? *A time requiring your admission of wrongdoing, which meant swallowing much pride, asking for forgiveness. Forgiveness may have been granted or not – God still asked you to love that person. It would be awesome for one person to share their personal love story (marriage). It doesn’t have to be perfect — just honest and faithful. Rebekah and Isaac’s love story is considered one of the most beautiful in the Bible. Their marriage was not perfect, however. I do intend to include Rebekah in one of the “women of the Bible” segments. These would fit together well.